Zee Music Company are proud to present the highly anticipated brand new banger released by Prem Hardeep entitled “Goriye” featuring Kaka Bhaniawala, Desi Ma, Arjun & Blitz! Taken from the brand new Bollywood movie soundtrack “Gully Boy”, scheduled to release in cinemas February 14th! 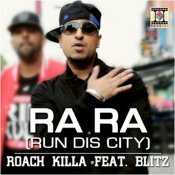 Roach Killa releases his latest single called Ra Ra (Run This City) featuring Blitz! ARE YOU Blitz? Contact us to get a featured artist profile page.